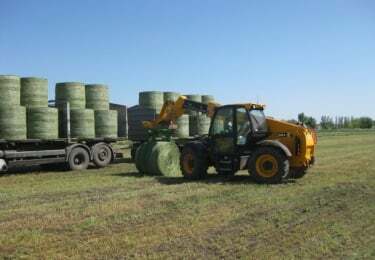 McHale R5 –Round Bale Handler. Simplicity, versatility and strength are the main features of the McHale R5 Round Bale Handler. 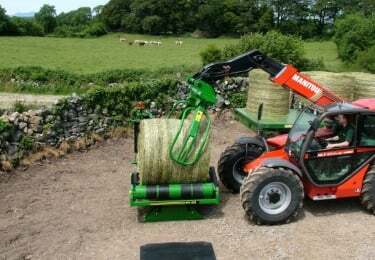 The McHale R5 round bale handler is ideal for collecting round bales, which have been tipped on their ends in the field. 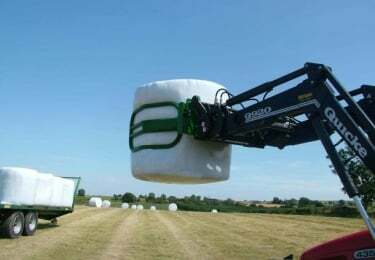 The McHale R5 Round Bale Handler can also be used to collect round bales, which have been left normally after a baler and rotate them through 90 degrees and stack them on their ends so that they hold their shape better. 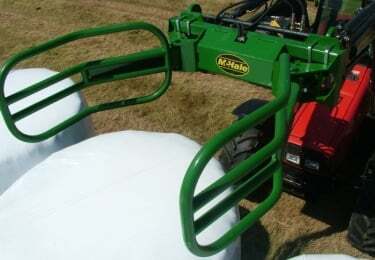 The McHale R5 round bale handler is designed to keep the round bale as close as possible to the loader carriage. This gives better control and balance. The bale hands on the McHale R5 round bale handler are designed so that they cradle the wrapped round bales without damaging the plastic. 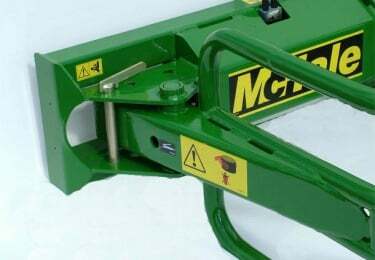 On the McHale R5 round bale handler one of the arms can be locked in position using the pins so that all the movement occurs in the other arm. This is useful when stacking round bales in a trailer or in confined spaces and sheds. The McHale R5 round bale handler can also be used to handle unwrapped round bales or load round bales onto linkage machines. 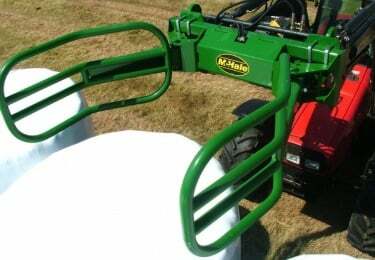 The McHale R5 round bale handler is ideal for loading trailers to take bales to a storage or bale wrapping location. The McHale R5 round bale handler can be used to load a static bale wrapper such as the McHale 991LBER. 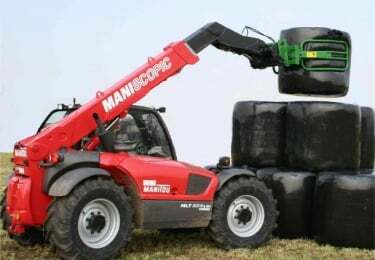 Once the bales are wrapped the McHale R5 round bale handler can rotate them through 90 degrees and stack the round bales on their ends, where there is more plastic and the bales hold their shape better. The McHale R5 round bale handler has a heavy duty ram which is fitted with a check valve. The check valve ensures consistent grip of the round bale as it is being transported. It also means the loader operator does not have to keep topping up the grip on the loader.